The season of Advent has always felt to me as if it is, and should be, a time of quiet meditation. Moving in a direction contrary to that of secular society in its frenzied rush towards Christmas exhaustion, a Catholic ought to be able to push away the distractions and focus on preparing inwardly for the mystery of the coming of Christ — the One who has come into the world as Savior, the One who will come at the end of time as Judge, the One who comes into my soul by His grace. And the sacred liturgy, it seems to me, ought to help us to be still, to be receptive, to be attuned to His voice. Ideally, it should immerse us in an expectant silence from which true and redemptive joy can proceed. As the liturgy developed historically and its ritual and aesthetic elements became more fully developed, it seems that the Christian clergy and people followed an unerring instinct towards the creation of prayers, chants, and ceremonies that allow TIME for the soul to absorb the meaning of what is happening. This psychological-spiritual opening up of space and time for the soul’s growth is accomplished in many ways in different rites or rituals. It is done through repetitious prayers, as in the Byzantine litanies, many of them redundant, though always eloquently worded; it is done through periods of silence in between periods of proclamation; it is done through motions, processions, non-verbal actions; it is done most of all through meditative chants that do not seem to be in any hurry to be finished, and which allow the mind a certain holy leisure or rest. There are repetitions, gaps, spaces, pauses, and visual signs that do not demand of the mind the constant tackling of new ideas or concepts, but permit it to dwell or linger somewhere before moving on. The liturgy is like a winding path up a steep mountain, with open ledges on which one can rest before continuing. In this way, it emulates the spiral motion, the combination of the straight and the circular, that Pseudo-Dionysius envisages as the soul’s path into God. There is a forward progression, yes, but it takes its time winding around, in order to move up at a human pace. Attempting to go straight up or straight in would defeat us. The classical Roman Rite of Mass, particularly in the form of the High Mass or Solemn Mass, admirably displays the spiritual pedagogy of the spiral motion, the frequent ledges, the moments of prayerful repose before continuing on with our climb up Mount Calvary, Mount Tabor, Mount Sion. In contrast, the Novus Ordo is designed in a manner contrary to this spiritual pedagogy, and thwarts the soul’s ascent up the holy mountain. Traditional liturgical rites of East and West are fertile in processions. We are pilgrims and we act out our condition. A town, the grounds of a church, the church building inside, offer a symbolic geography to be covered and converted as we move from point to point. The time it takes for a leisurely procession is one of the most important “burnt offerings” we can raise up, since our time is, in a way, our life and energy. 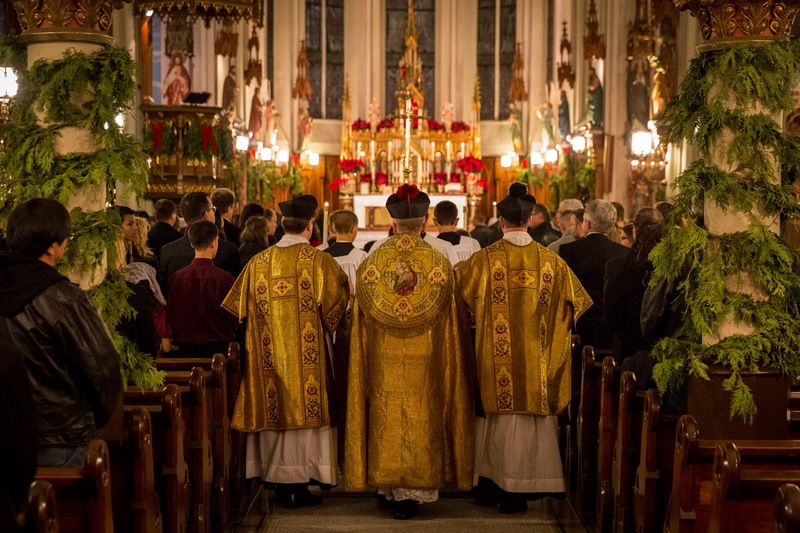 The Holy Sacrifice of the Mass, in particular, should open with a stately, unrushed procession of splendidly vested ministers towards the sanctuary, accompanied by grand music (instrumental or choral or both). Those ministers represent us, and we are walking with them towards the Holy of Holies. This is a solemn and wonderful moment, with its own distinctive meaning and satisfaction. Why do we completely spoil the effect by asking people to put their noses in a hymn book? The choir or schola should be lifting up our minds to God and allowing us to experience this procession as a procession, with all our senses in act. Where the procession is well done, it becomes one of these occasions of journeying without the baggage of the nagging necessities of the workaday world. Then we come to those marvelous preparatory prayers, which I always miss so much in any Novus Ordo Mass, where we suddenly start BANG!, without taking time to prepare well for what is to come. The traditional liturgy pauses for a breath at the end of the procession and, rather than rushing into the sanctuary, recites Psalm 42, the Confiteor (twice), and versicles and prayers expressive of the forthcoming sacrifice. We are suspended between the entrance and the commencement, the intention and the execution, and our souls can expand, adjust, collaborate, get ready to move on. It reminds me of the process whereby one’s eyes adjust themselves to the indoors when one enters a dark room from a bright sunny day outside. Our spiritual sight is accustomed to the garish day, with its obvious objects and confident navigation. At divine worship we are being drawn into the interior, the innermost, the mystery that is luminously dark, caliginously blazing, and we do not know our way. We need some time to adjust. What blessed minutes, which carry us so gently and yet so irresistibly into the sphere of the divine! Whether we are at a Low Mass or a High Mass, one of the greatest blessings of the TLM is that, on the one hand, we are gently drawn into prayer, as if by an invisible hand nudging us forward, and, on the other hand, we are not immediately talked to and expected to talk back. We are surely participating in the unfolding drama, but we are not targeted and harried; the activity does not get bogged down in a closed circle, like a boring classroom. The liturgy seems to be going on over our heads or around us or in front of us, and we can relate to it all the more deeply because it is outside our grasp, beyond what we can access, with no possible illusions that we are the ones driving it forward. Of course we have a role to play, and this will sometimes include verbal responses; but the overall effect is one of a giant motion that we can join, if we will, that will take us somewhere our own resources could never get us. The unfailing Introit, announcing the day’s mystery, throws down a sort of spiritual gauntlet: “Friend, wherefore art thou come?” (Mt 26:50). The cascading Kyries, the exultant Gloria, the richly compact Collect, the apt Lesson, invite us to come deeper and deeper into worship, putting on the mind of Christ. If the preparatory prayers seal the door to the world and habituate us to the new climate of worship, and if the subsequent prayers and lesson demand of us the exercise of our spiritual capacities, it is the interlectional chants, sung in full, that have the special power to plunge us into meditation and even contemplation. At other points in the Mass, multiple things can be happening at once (the peculiar perfection called “parallel liturgy”), but here, during the Gradual and Alleluia — or the Gradual and Tract in Lent, or the double Alleluia in Paschaltide — the ministers take their seats, the people are seated. A restfulness descends with the sound of the chant; time stands still. The melismatic melodies draw out lovingly, syllable by syllable, the exquisitely beloved words of God, so that we cannot rush past them, or treat them in a utilitarian way, or think of them as mechanical responses made to a dreary rehearsal of psalms. They exist in and for themselves, living monuments of God’s faithfulness and love, and we are permitted to have them on our lips, in our ears, in our hearts. 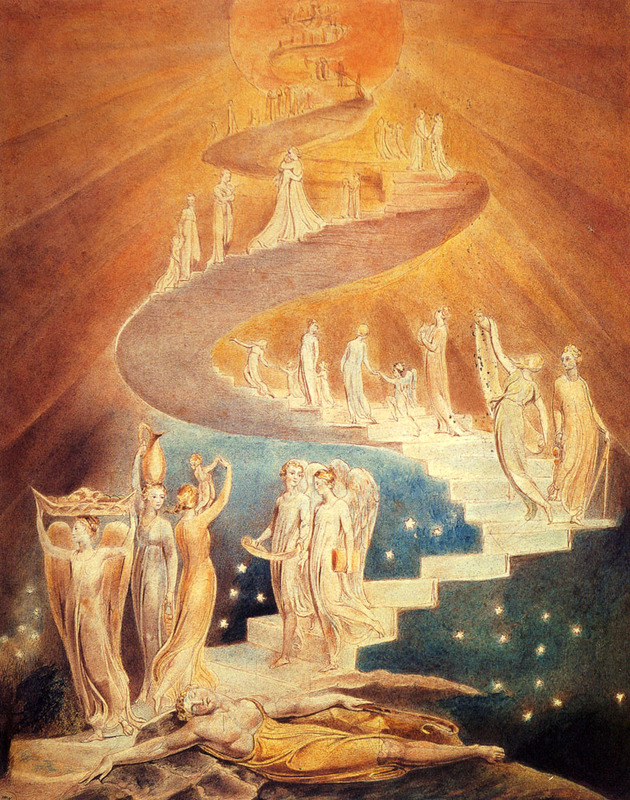 They are a ladder let down from above on which we are bidden to climb up. In this way, the Lesson and all that has come before has a chance to sink in, and the soil is plowed with deep furrows for the Gospel and all that will come after. I shall continue next week with the Offertory and the Canon of the Mass. Interestingly, St. Benedict cites this verse in chapter 60 of his Rulewhen speaking about a priest who desires admission into the monastery. He says that the priest may be admitted only on condition of agreeing to abide by the entire rule, as if to say: Why are you coming here, unless to embrace and benefit from the monastic discipline? The liturgy, too, is something we should approach only if we are ready to embrace its discipline, which is the only way to obtain its benefits. I am indebted to Dr. William Mahrt for opening my eyes and ears to the theological and liturgical significance of the interlectional chants (Gradual, Tract, Alleluia). They are the contemplative and musical high-point of the Gregorian Mass prior to the consecration. This was wonderful to read when I read it the other day. How wonderful this is to read and ponder! As a child and teen, I loved this Mass..TLM…I went everyday..even walking through snow in NJ to attend! I could never put into words what this meant to my soul, but reading this by Peter Kwasniewski, touches my spirit to a depth which I never knew existed inside my heart. So many memories it brings back! How it did allow time for the soul to absorb the mysteries! Today, at 3PM, I prayed from the red book, as Mass was being celebrated in Texas, but I felt as though I was there…absorbing the Mystery of it all!! Dear Lady of Guadalupe, you are my dearest “Mama” and I thank you for this Mass today, and the Rosary afterward. I thank you for the Silence of God! I am looking forward to Part 2 by Peter Kwasniewski…the Crescendo of the Mass…the Consecration!